TG: How did this journey…acting…Mumbai…start? TG: What did the judges ask you? What was the question? SP: I still remember I was the first contestants to walk up on stage so when the announcer called out my name and I walked out…no one clapped or hooted for me!! So, we were given a situation and they asked if it is your boyfriend’s birthday and you only have a certain amount of money, how will you celebrate his birthday? So, I answered that we’ll go for a walk on the beach, have some paani-puri and naariyal paani. So they asked me what about dessert and I said...’mein hoon naa’!! I think the judges found my answer very witty but my answer was genuine and spontaneous. I did really well in the talent round because I sing well. I was an Indian Idol Season 3 contestant but I had to leave the competition because of my board exams. TG: From Baroda to Mumbai…were you anxious? SP: The finale for this pageant is at a national level and I had to come to Mumbai for that. We had to undergo an intense grooming session for a week and there were some well known people from television and Bollywood who trained us. Mumbai was something! I mean, people are out and about in the middle of the night. Now, I was 17 years old and my mom said that she would come to Mumbai with me. She could not come alone so dad came along and I had an uncle in Mumbai so it was like the whole family accompanied me! The organizers told me that I could not stay with my family. At the end of the day, this pageant was my journey so I would have to stay with the other contestants. That was my first lesson in Mumbai…I had to learn to be independent. So, I moved in with the contestants and I would cry all night because I just wanted to get the hell out of there! Our workshops started and we had dance sessions with Shiamak Davar, we were taught how to walk on the ramp and gradually we got really busy and all the contestants became really good friends. After our sessions, we would go out for walks on the beach, we would walk around the city and have chai late at night! I was the youngest girl in the group and everyone would look after me. I did really well in the pageant…I won Miss Runner-up, Best Smile and Miss Photogenic. You know, after I won that title, I had my first portfolio shoot done and my pictures were published in television magazines. That is where I started getting noticed…. TG: But you decided to come back home to Baroda? TG: Gulaal was a beautiful show! What was that experience like? SP: Gulaal was so much fun but at that time, ‘mujhe kuch nahin pataa thaa’. Manasi Parekh is a dear friend and I lived with her. I did not have a place in Mumbai and Manasi had promised my mom that she would take care of me. So she would make sure I had my Omelette, bread and Bournvita every morning and she really looked after me! Gulaal was my first show and I had never acted before that. We started the shoot with an outdoor in Jodhpur and I still remember my first shot! I was supposed to run while looking for Vasant and I kept looking up…while running! So, my director – Sidharth Sengupta said – ‘Vasant upar ud nahi rahaa hai! Neeche hai, neeche dhoondh usko’! It was so funny! The entire cast and crew of Gulaal were just lovely people. They would make fun of me because even when I had a back shot, I would touch up my makeup!! We had an entire Garbha dance sequence when Gulaal was introduced in the show and we shot that sequence for 3 days…I have such wonderful memories from that show. My work was completed in 20 days and then I returned back home. I told Neeru ma’am that I will come back to Mumbai once I had completed college. TG: So the acting bug had bitten you and you did come back to Mumbai? SP: Once I finished college, I came back to Mumbai with my dad. I went to Neeru ma’am but she did not have any shows coming up. I had started receiving calls and I went to STAR Plus’ office to audition for a show called ‘Ruk Jaana Nahi’. I was also offered a show called ‘Chhal’ and that was really exciting because it was not a regular saas-bahu show, it was a thriller. For some reason, the production houses would love my auditions, we would talk about getting things finalized and then either the show would get cancelled or there would be money issues. I had started missing home and I was ready to go back. The day I was supposed to head back, I got a call from a production house called ‘Directors Kut’ and I had no idea who they were. I read the script of ‘Havan’ and I kept telling my mom, this is ridiculous…aisay koi ladki hoti hai kyaa? She keeps going Baap ji…Baap ji! My mom told me to rehearse the script and give it my best shot. I had no conviction in the character and I just went and gave an audition. When I came back home, I told my dad about my audition and the production house and he googled it. Turns out, I had auditioned for Rajan Shahi sir! I mean, I had grown up watching Bidaai and I remember telling my dad that I would love to work for Rajan sir!! I felt really bad…I felt like I had goofed up big time. A few days later, I got a call from Rajan sir’s office telling me that they had liked my audition and they wanted me to come down for a mock shoot. I came to Mumbai and signed the contract! Everything happened so smoothly. My mom loved the production house and Rajan sir promised my mom that he would take care of me. He became a father figure and even today, he never forgets daughter’s day! We had some amazing workshops and ‘Havan’ was a fantastic experience. That entire project was a dream come true for me. You know, sometimes you ask God for something and he says…’Tathaastu’. My second serial was with ‘Hats Off Productions’ and I used to watch Sarabhai vs Sarabhai religiously! As soon as Havan was done, I got an offer from Hats Off Productions and Rajan sir advised me that if I was getting a lead in JD sir’s serial then I should take it up. That’s how ‘Byaah Humaari Bahu Ka’ happened. Unfortunately the show did not do too well but I had the opportunity to work for JD sir and that was something! TG: Were you nervous about IPKKND 2? Considering the first season had such a massive fan following? SP: No! You know sometimes ignorance is bliss. I never followed IPKKND 1 and I really did not know much about it. I had no idea that the first season of the show had such a massive fan following. When I got this show, I never thought that I would be stepping into someone’s shoes and I was blissfully happy in my own heels! We had shot the promo for the show in Hyderabad and when the first promo was released I was on the train back to Mumbai. I watched the promo and my mind was yelling ‘Yippee’! Then, I started getting calls about the negativity and I went on YouTube and noticed 24 likes and two thousand something dislikes! People were writing such horrible and abusive comments. I am a very sensitive person so I called my promo director and as soon as she answered the phone she asked me if I had liked the promo. So I said…well I did…but people are not appreciating it. She laughed and replied, it’s not because of the promo darling, all the negativity is because of season 1! TG: Once the show started, what kind of feedback did your character receive? SP: Initially, I used to get negative feedback. My father keeps track of all these websites and he would tell me about the comments and feedback. See, the thing is that we never aimed at taking the place of any other show. We had a completely different story under the same name. Once people watched our show, they realized that we were good. I worked very hard and left the rest up to God. At the end of the day, I was convinced that at least some people would appreciate the show and that did happen. TG: Every time I visit a set, I notice 30-40 people at a shoot. So as an actor, you are not just facing the camera, you are acting in front of so many people. Is that easy? SP: See, everyone is doing their job. Once the director says ‘action’, I just start my work. Once you hear the word ‘action’, everyone on that set gets into their own roles. The light man’s job is to make sure that the lighting is perfect and he is completely focused on that. If I had been in theatre, I would have had to act in front of thousands of people. Having said that, I do get very conscious in front of my parents. Even now, when they come to my shoot and I have a romantic scene, I get really nervous! TG: From the point you started in Gulaal to now…how have you grown? SP: You know, I come from a very protective family. When I was shooting for Gulaal, I was surrounded by so many people but I had to learn how to be on my own. Havan taught me how to act because I had to attend so many workshops before the show started. Byaah Humaari taught me how to enact a romantic scene because before that I had never really dealt with on screen romance. IPKKND2 has taught me to focus on quality in terms of my work. Waseem Sabir is an institution and I really look towards him for guidance. He teaches me the little nuances and he will explain the scene in such a way that it just changes your perception about the whole scene. TG: Has there been any one scene that really affected you…something that Astha went through but as Shrenu, it really affected you? SP: Oh, the suhaag raat scene really affected me. I was crying for two days because I was so depressed. Waseem sir had started preparing me for the scene a few days before we had to shoot it. The day we had to shoot the scene, everyone was a bit low and there was pin drop silence on the set. That scene was shot in 2 hours and for the first time ever, Waseem sir clapped for me when we finished the scene! Avinash and I were completely immersed in the scene. I just could not sleep that night and the next day, Waseem sir and Avinash told me that I had to come out of it. You know, I am Astha…I am living Astha’s character and it is not easy for me to switch off. I went through that break up and I kept thinking…this is such a horrible thing for a girl to go through. You fall in love with a guy and start weaving some dreams and he breaks your heart, calls you naïve…and you are married to him! Everyone appreciated that scene and I received a lot of positive feedback and comments for my work. TG: Sometimes you read a line and say…Astha will never say this…does that happen? SP: Yes! That does happen. We discuss the scenes and dialogues but then I work with a team and we find ways to make it look convincing. Waseem sir will always show me both sides of the coin. If I tell him that that I am not convinced about a certain dialogue then he will give me some context…a point of reference. Even though I live Astha’s character, there are many differences between Shrenu and Astha. I mean, Shrenu will never fall for a guy like this! I know we are emotional fools, we make mistakes and get our hearts broken but Shrenu will never be such a huge emotional fool! He keeps putting her down…I mean how can you keep loving this…this jerk?? I do have the same family as Astha and my parents have been so supportive of all my choices. I have a beautiful kid brother. Astha has a very open outlook and I have that same modern outlook, thanks to my upbringing. Astha is much more mature than me. I am a complete kid, I am very clumsy, and I’ll drop my phone so many times! Astha is very strong but sometimes I feel she does some foolish things. TG: The suhaag raat scene got you depressed…any scene that made you laugh? SP: Oh! The slapping scene was so much fun! Poor Avinash! When he slapped me, it was a cheat. When I had to slap him, Waseem sir told me to do it for real. I slapped him pretty hard…oh God…poor guy! you are a heart loving person with full of dreams. i prayed for your happiness because i found crazy/honest girl inside you. yes, i like you the way you are. Hope we meet some day.. and i'm Gujarati. Shrenu, you helped me grow as a female. This is the third of yours interview I read. Trust me, its as real as previous one. You are such an amazing and inspiring personality. God bless dear. Very nice shrenu..i like your answers,you and avinash one of my favourite jodi...keep it up and god bless both of you..
Its always a pleasure to read an honest interview. 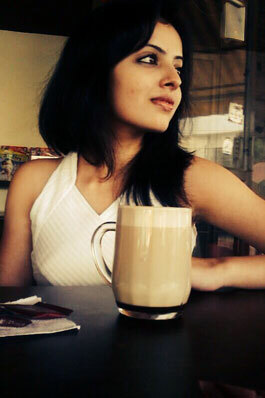 Shrenu Parikh, an artist not trying to live upto an image but working to live upto her believes & ambitions. Thanks for your unbiased journalism. Very spontaneous open interview. Shreni is a young talented actress, I admire her. Thank you for this interview which details Shrenu's humble journey into acting. It was a pleasure to read. Much respect to her for giving priority to her education over fame. Shrenu comes across as a refreshingly honest, grounded and pragmatic individual. Her positive attitude and sincerity will carry her far. Moreover, I like that she gave due credit to the helpful and wonderful people she has worked with that have shaped her career thus far. Her growth as an actor is visible from her work in IPKKND...EBP as the Suhaag Raat scene is my favourite from the show. The Holi confession scene and subsequent bhaang ka nasha antics are a close second. I hope Shrenu remains down-to- earth and gets her share of success too. Shrenu is such a beautiful and refreshing person in today's TV crowd. Love her for her beauty, simplicity, and her immense talent. Her acting talent has grown by leaps n bounds from the time IPKKNDEBP started! Really nice interview! Shrenu is a great actress, really talented, but in the same time so natural and so down-to-earth and that is why she deserves all the respect and love from her fans. 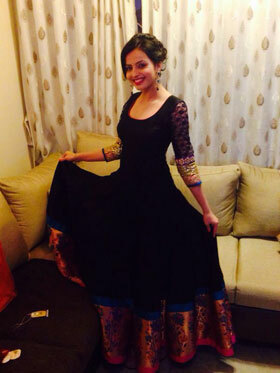 such a beautiful person in & out our Shrenu. Nice interview, hope see more. Wonderful interview and wonderful girl...we love her simplicity and hard working nature. Hope sgs achieves great success in her career and ipkknd ebp soon reaches #1 slot. awsome..yrr....shrenu is really a down to earth...person.. Awesome interview! !..I liked the simple questions and the honest replies. 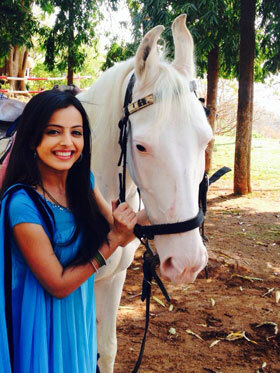 I am loving aastha's character and hope to see her become as strong as you are shrenu . Tc.